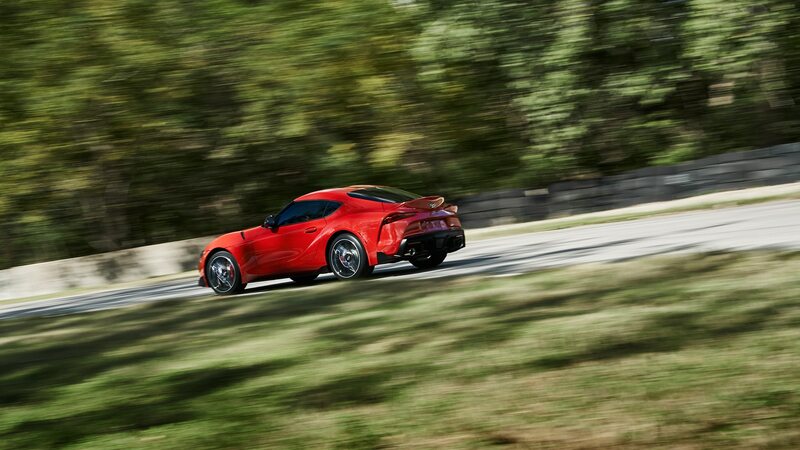 Even after all the hype, the Supra teems with interesting tidbits. It’s back, baby! 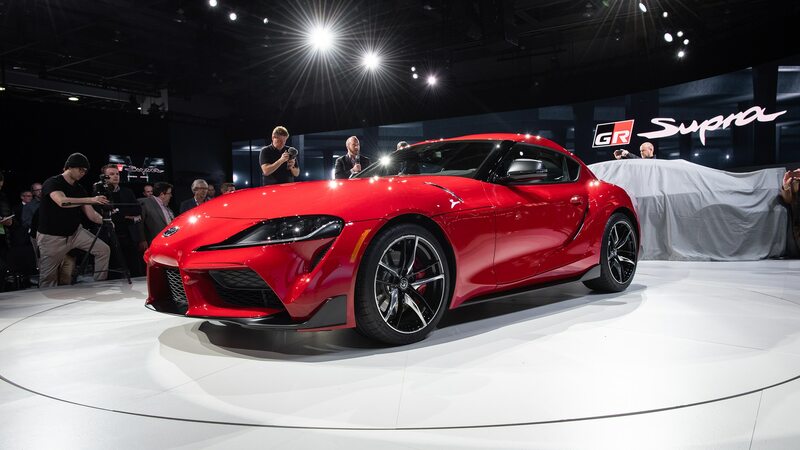 After a lengthy incubation period followed by a seemingly never-ending pre-reveal teasing phase, the 2020 Toyota Supra is finally living and breathing and will hit the streets this summer. We’ve already published our Supra deep dive in the wake of its 2019 Detroit show reveal, and we drove a prototype of the all-new Supra prior to that. 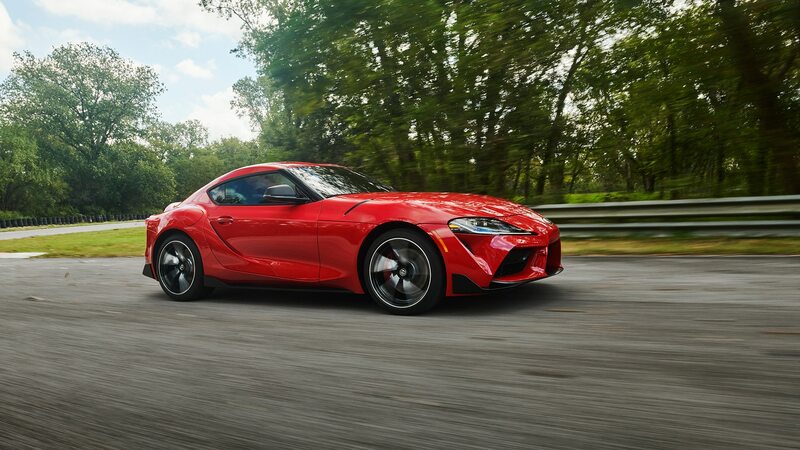 From all the info and from behind the hype, here are eight elements of the car that Supra fans and newbies alike should know. Impress your friends! 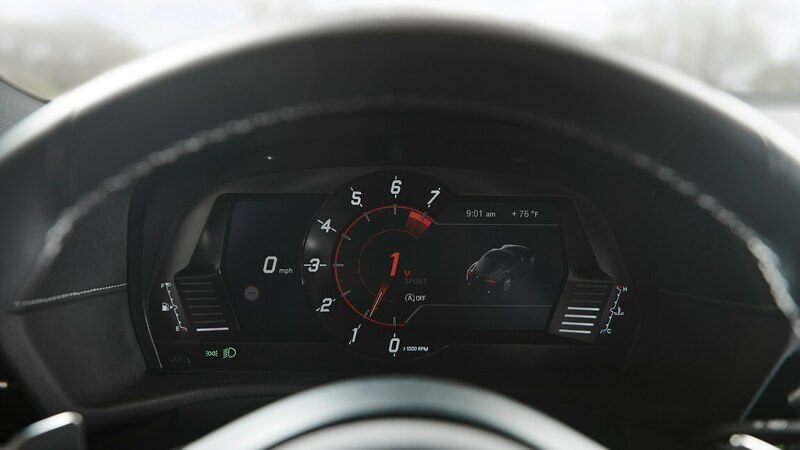 Even before the swoopy FT-1 concept landed at the 2014 Detroit auto show, rumors of production swirled around the event. 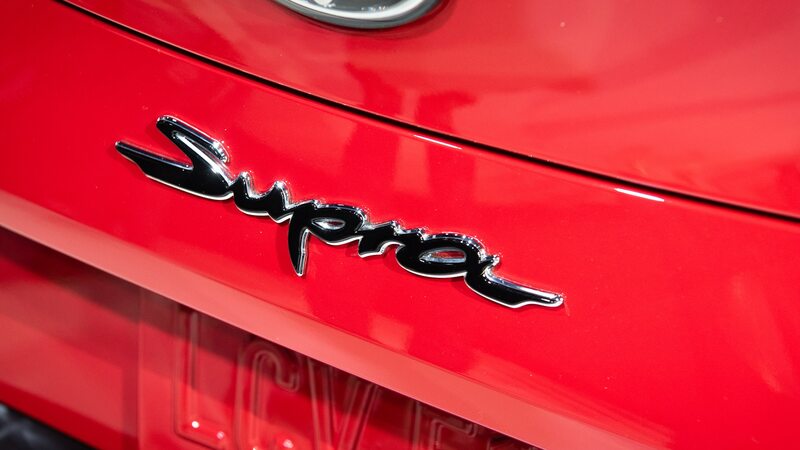 The “Supra” nameplate was whispered repeatedly, but some thought it was too fantastic to be believed. 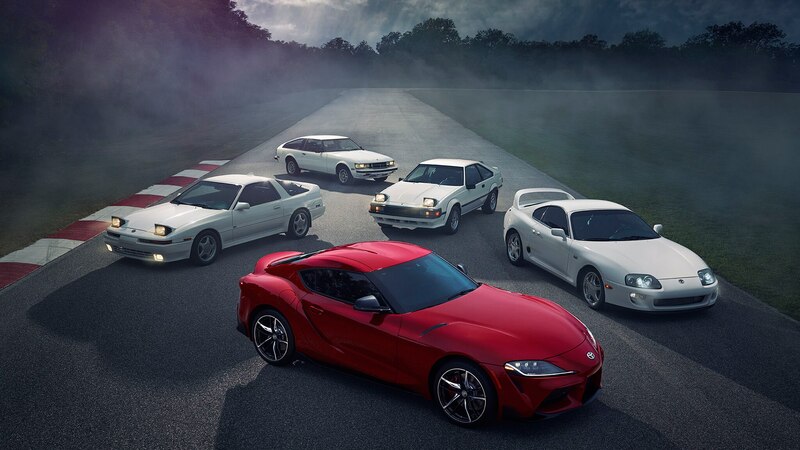 It was almost more fun to dream that the beloved Supra would someday return. But now, five years later, it’s finally here. 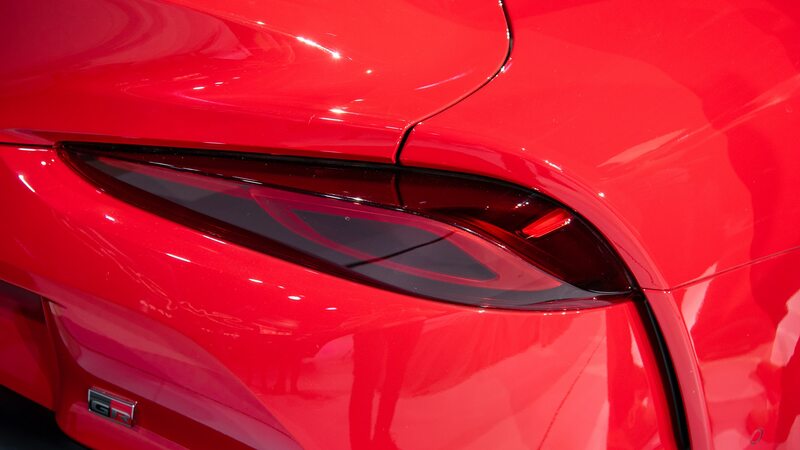 Not only that, but it looks visually similar to the FT-1 concept that started all the chatter. 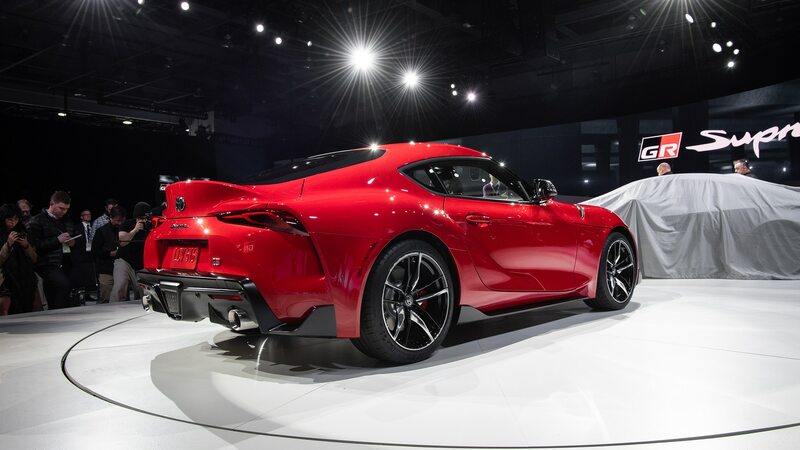 Including the bisected nose, the double-bubble roof, and the sculpted rear end, the new Supra indeed cribs heavily from the FT-1—just scaled down considerably for size and roadworthiness. For more about the transition from concept to reality, check out our interview with the Supra’s chief designer. 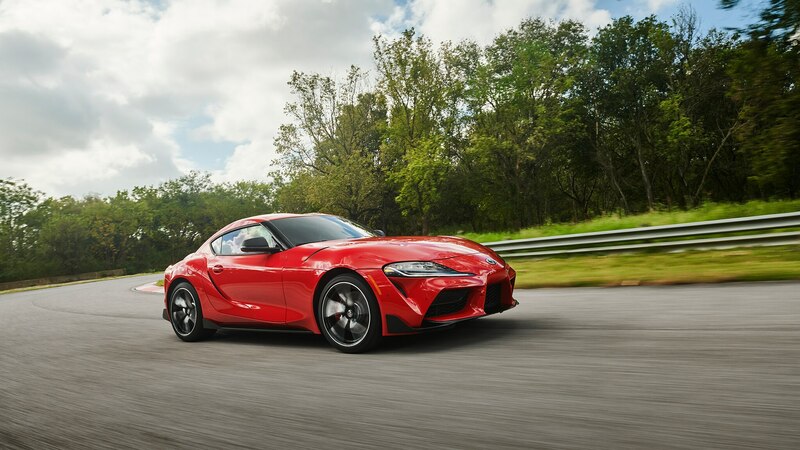 The partnership that sees the Toyota twinned mechanically with the new BMW Z4 roadster allowed it to stay true to the Supra’s inline-six heritage. After all, BMW are masters of that engine type. 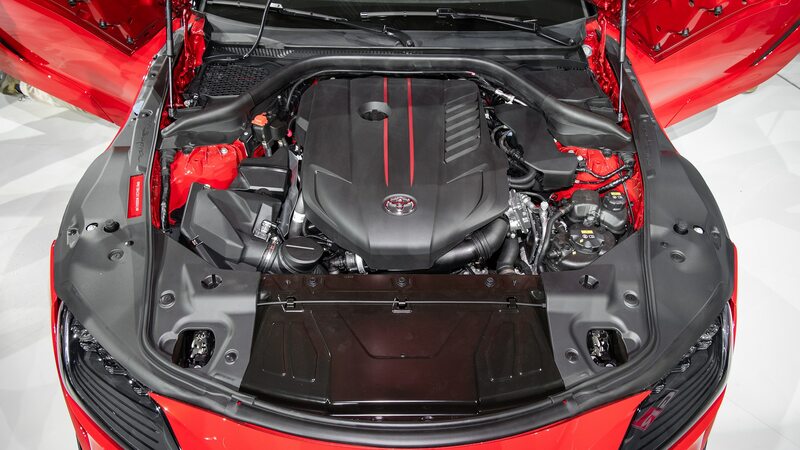 The result is a 3.0-liter turbocharged sixer with 335 horsepower and 365 lb-ft of torque, enough to scoot the coupe from zero to 60 mph in an impressive 4.1 seconds. Keep it pegged and the needle won’t stop until it hits a limited 155 mph. Despite its power and performance, it won’t break the bank at fill-ups, as it’s expected to achieve in the range of 21/30 mpg city/highway. 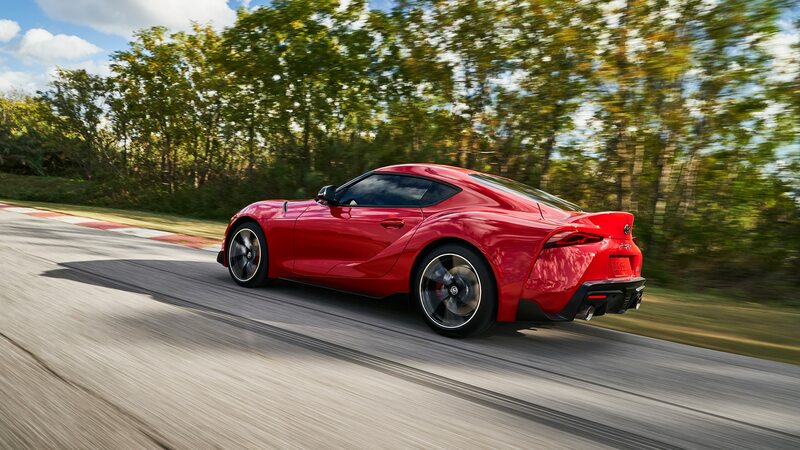 Unfortunately, the Supra will arrive here with a ZF-sourced eight-speed as the lone gearbox. This decision didn’t endear itself to the row-your-own crowd, but the ZF eight is a quick-shifting, well-proven transmission. The best way to predict future powertrain upgrades and packages is to follow the evolution of the Z4, as anything offered under its could eventually make its way to the Toyota. 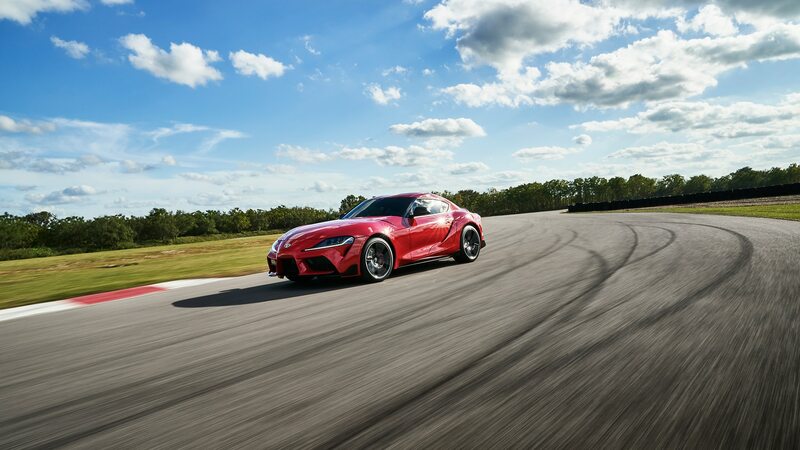 So if the Z4 goes manual, expect the Supra to follow suit—and vice-versa. 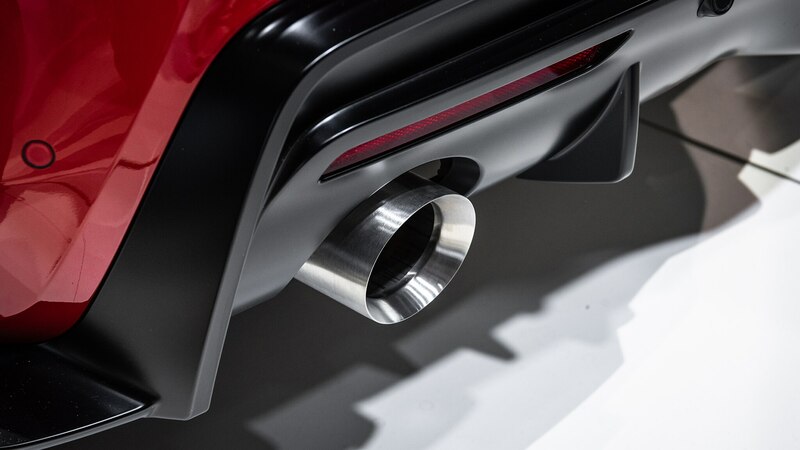 Indeed, chief engineer Tetsuya Tada has not ruled out a manual for the car, so make your voice heard. Previous Supras were known more for their moderately heavy, grand-touring dynamics, but the A90 Supra should be sharp as a tack. Along with a claim of perfect 50:50 weight distribution, there’s an impressive amount of hardware behind that gaping nose, starting with aluminum control arms in front and a complex five-link rear layout. 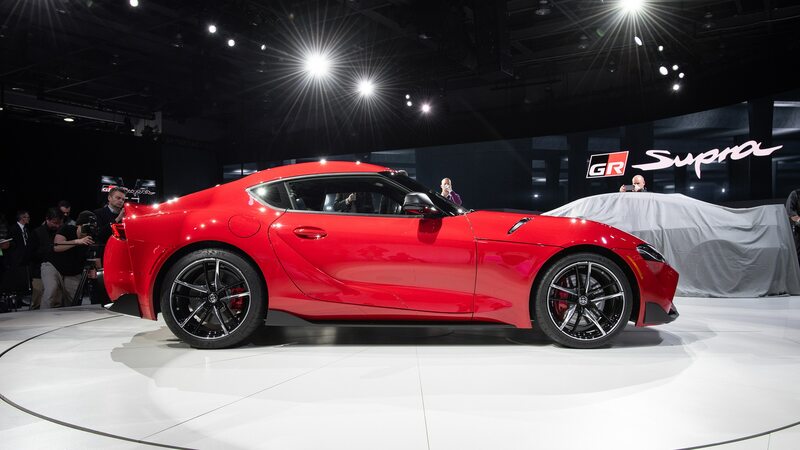 Toyota’s Gazoo Racing division tuned the setup to differentiate it from the droptop Bimmer’s. Aside from the mechanical bits, there’s also a fair amount of techno-wizardry at work as well. 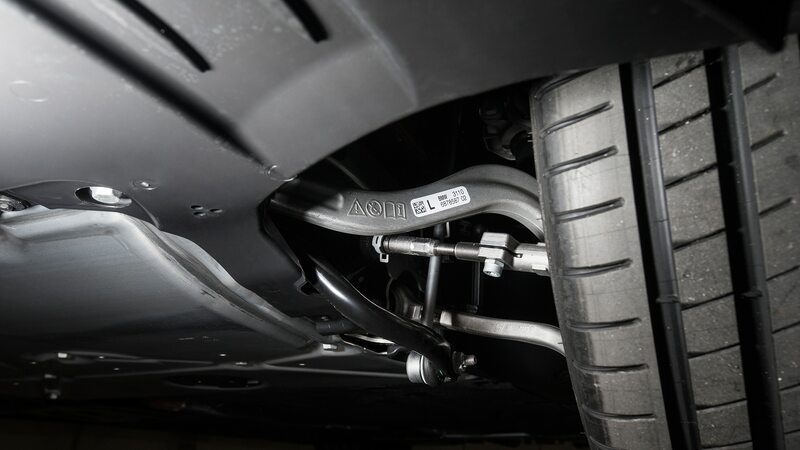 The suspension is adaptive and modifies the damping based on driving style and road conditions, working in tandem with an active rear differential to deliver ample power in the most stable and efficient manner possible. 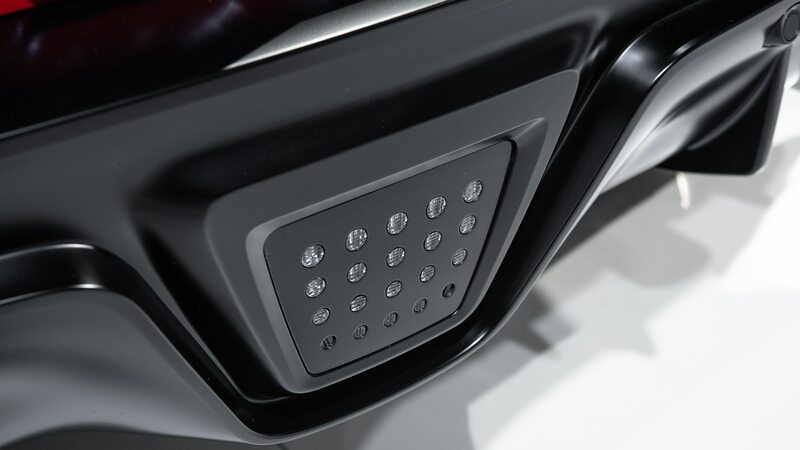 These active systems are controlled through a traditional Normal or Sport mode setup, each of which also adjusts exhaust note, steering weight, throttle response, and shift points. 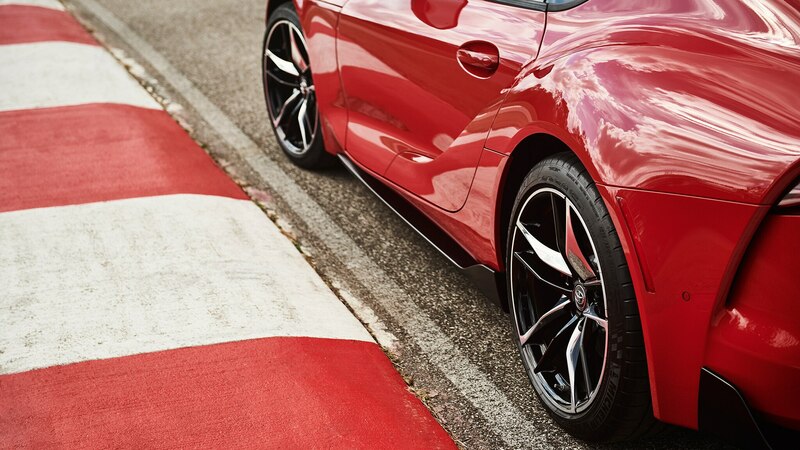 Advanced drivers can fully defeat the traction and stability control if they desire. 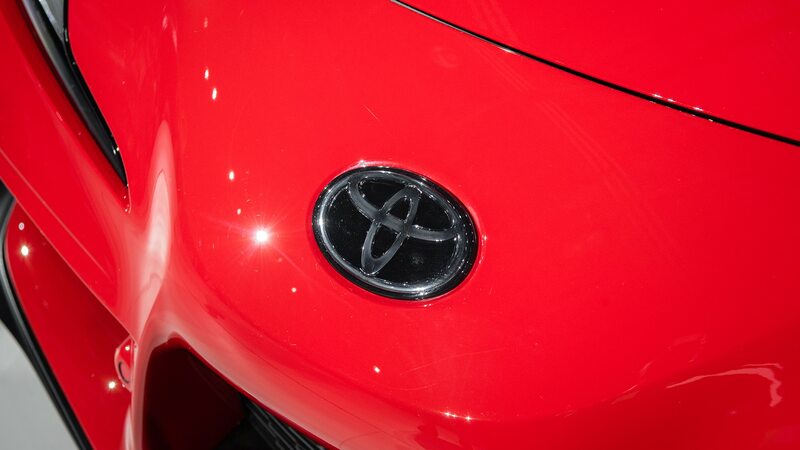 This is Toyota we’re talking about, after all. 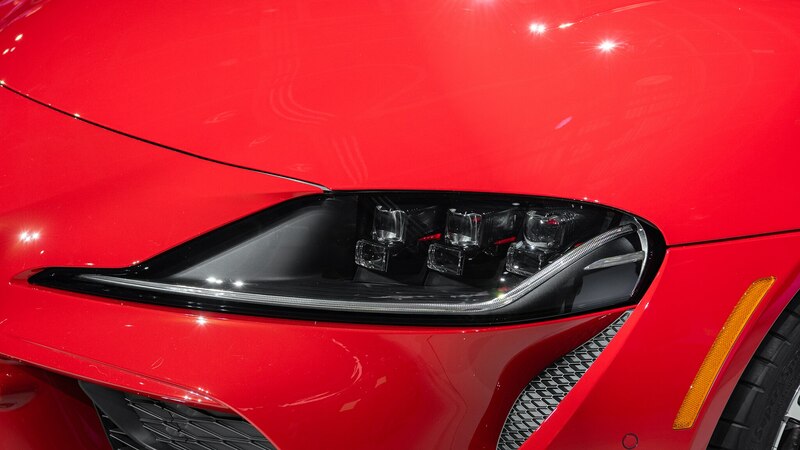 The automaker has never shied away from special-edition trims and packages, and it looks like the Supra won’t be any different. Aside from the regular 3.0 and 3.0 Premium trim, 1,500 Launch Editions models will be offered in the States. 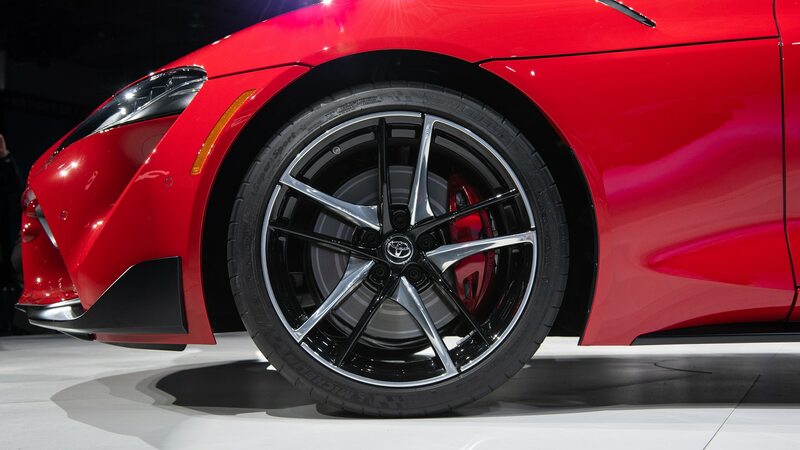 Based on the Premium, the cars incorporate high-contrast red mirror caps and matte-black wheels and only come in Absolute Zero White, Nocturnal Black, or Renaissance Red 2.0 paint. White and black launch editions have red, carbon-fiber-lined interiors, while the red cars receive black leather cockpits. 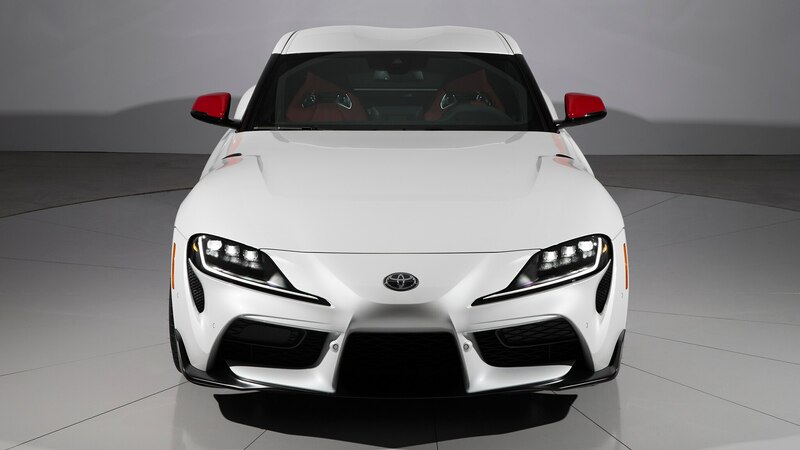 As a bonus, each Launch Edition features a carbon-fiber plate with a rendering of Akio Toyoda’s signature on the passenger dash, along with the requisite numbered carbon plaque. 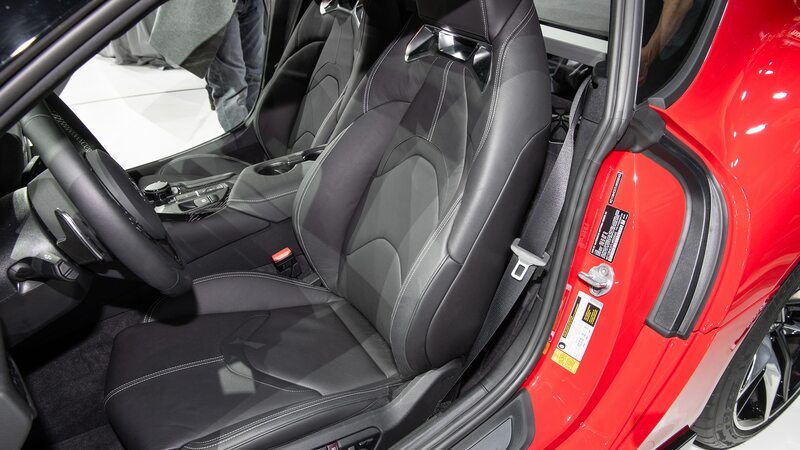 There’s more than a little Bimmer on the inside at first glance. 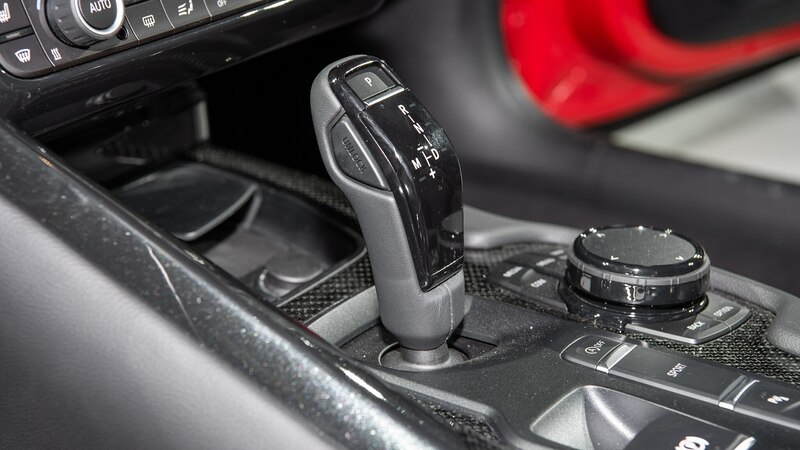 Aside from the steering wheel and the seats, much of the switchgear is adapted from Munich’s stuff, including the iDrive infotainment controls, electronic rocker gearshift, and basic buttons for the windows and headlights. 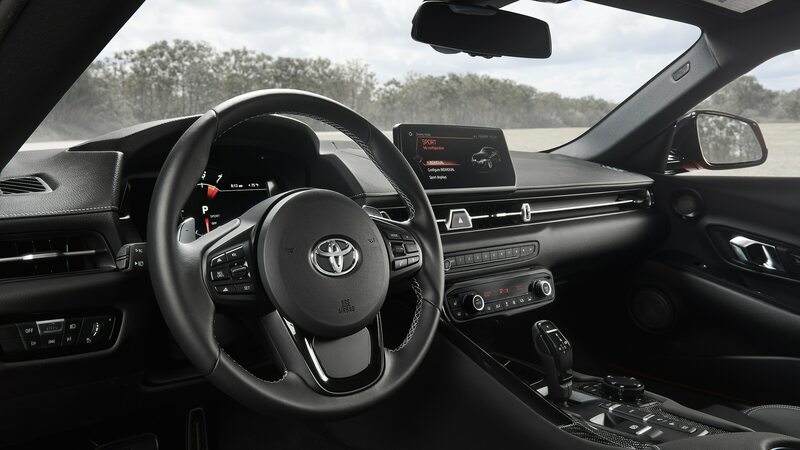 Heck, even the infotainment system itself is a reskinned version of iDrive, although Toyota officials tell us that the software is different from that of the unit in the BMW Z4. 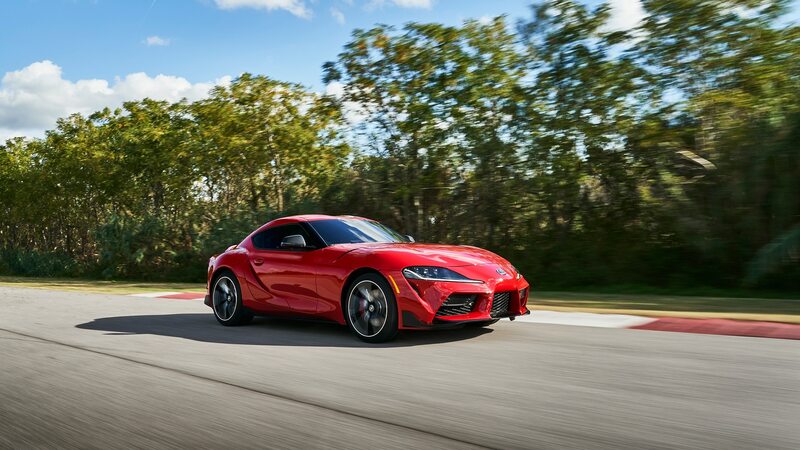 We also heard from Supra chief designer Nobua Nakamura that despite the BMW resemblance he and his team created a decidedly different look for the Supra’s cabin than the one found in its Z4 cousin. But if you’re going to incorporate elements from another company’s parts bin, BMW is hardly a bad choice. The Supra is available at launch for a base price of $50,920. 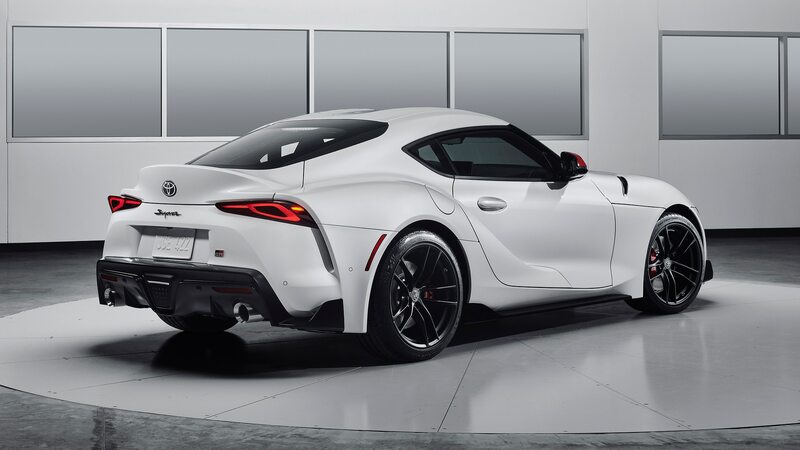 This puts it in a higher price bracket than the Ford Mustang GT and Chevy Camaro SS, but below what a Porsche 718 Cayman and BMW M2 will set you back. 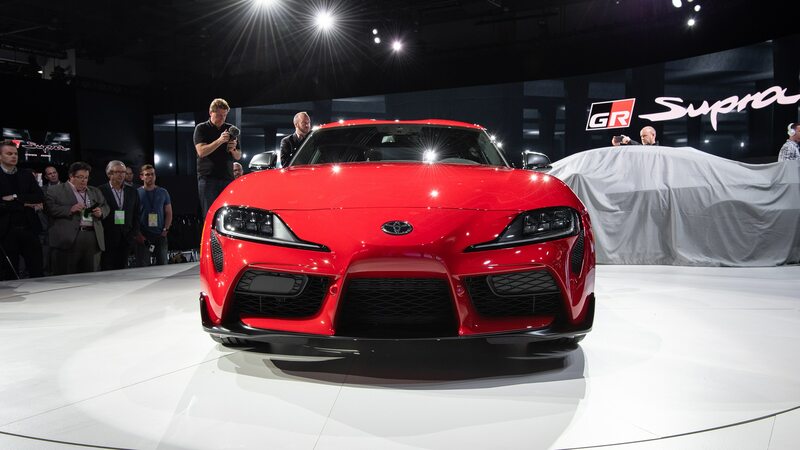 While Toyota hasn’t yet confirmed it for the U.S. market, the Supra will be available overseas with an inline-four. 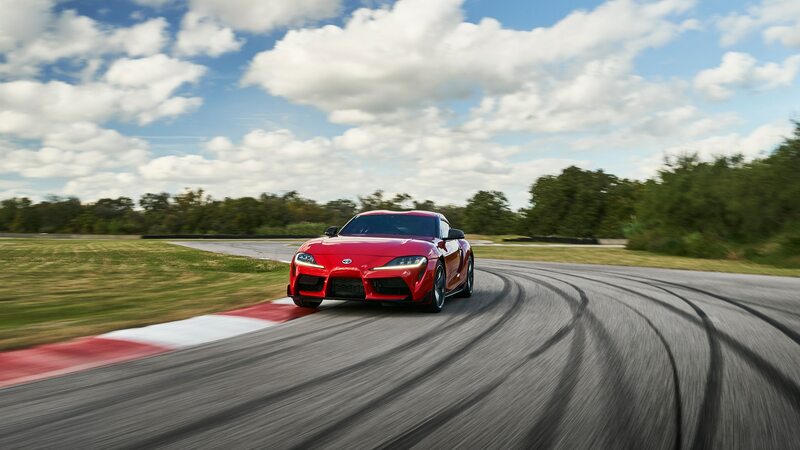 The Japan-only Supra SZ-R spec, for example, is powered by a BMW-sourced, turbocharged 2.0-liter four-cylinder putting out 255 horsepower and 295 lb-ft of torque. 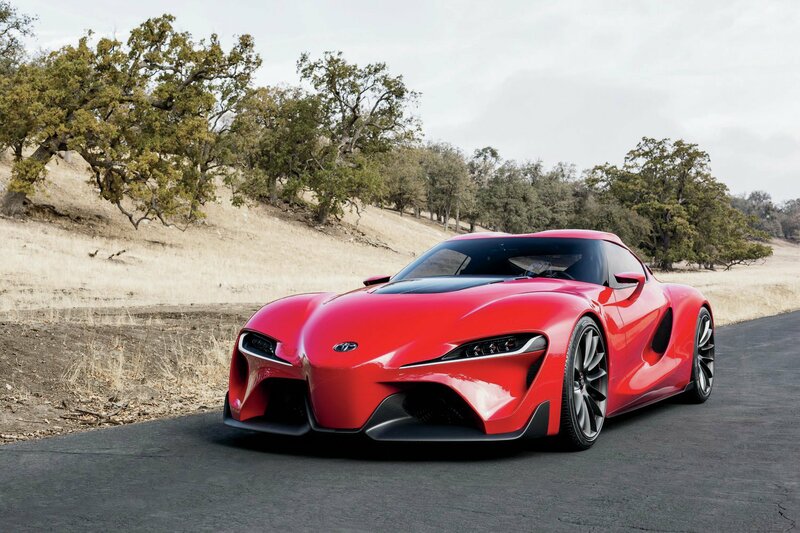 Expect pricing to be in the low-$40,000 range if Toyota indeed decides to bring a car like the SZ-R to America.